To what extent can rags be beautiful? Is there even a point at which fetishising the clothes of the poor– how threadbare they are, how re-worn and re-hashed – can be disrespectful? 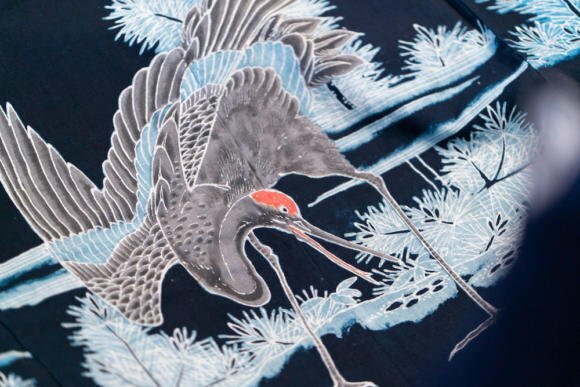 Twenty years ago, when Stephen Szczepanek began importing them into the US, neither question had really been asked about vintage Japanese fabrics. 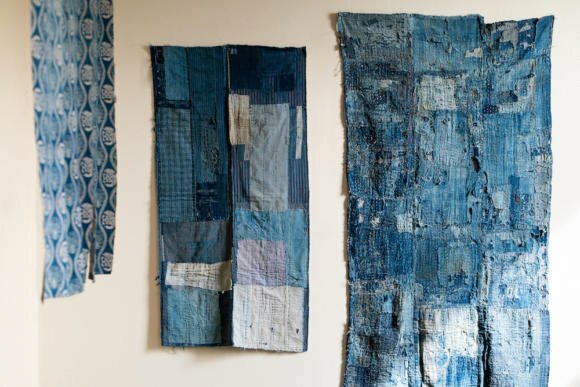 The clothes and ceremonial garments of the poor in Japan – with their faded indigo dyes, sashiko stitching and patchwork construction – were barely noticed, let alone collected. 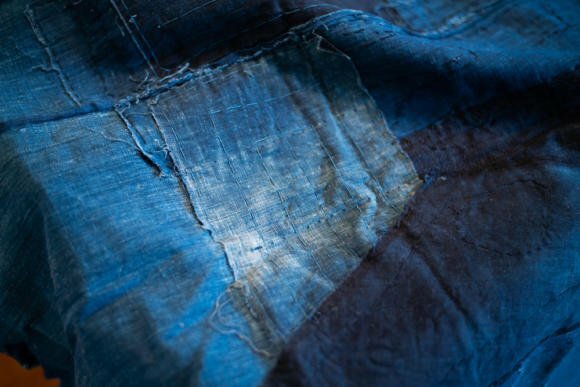 Today they are known by the term ‘boro’ cloth, and are obsessively bought, worn and recreated. It’s not hard to understand why. In an age that values craft and quality, that loves beaten-up Barbours and perfect denim fades, boro cloth is wonderfully authentic. It is also beautiful. The shots here of pieces in Stephen’s studio hopefully bear testament to that. An interesting question, though, is what makes one piece more beautiful that another? Is it better to have greater variation in colours, or less? Is one unexpected patch an effective counter-point, or a distraction? In the end these are really artistic questions, and admit little logic. 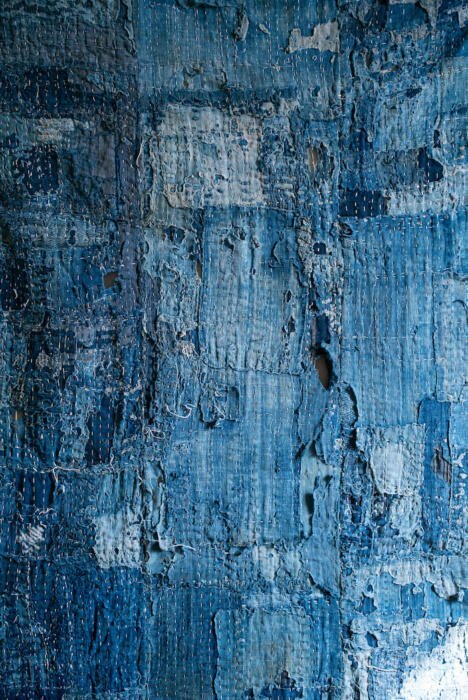 Indeed, the large sheets of boro aren’t that different to a canvas, and personally appeal to me more than more formal textiles-as-art (such as the work of Anni Albers, for example). Stephen first found examples of the cloth when he was travelling around Japan, but there wasn’t much available. It was mostly seen as rags, and certainly no textile distributors valued it. Today he goes back to Japan twice a year, when particular markets are held around the country. A friend of his also runs a shop in Kyoto, and takes a more academic approach to boro - researching the history of certain pieces, their regional variations and uses. 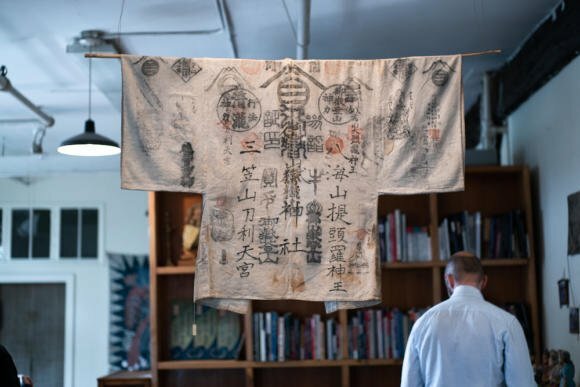 “Even though they might look ragged, these were largely ceremonial pieces: parts of a wedding trousseau, perhaps a kimono or a covering for the wedding bed,” he says. Although indigo is common to most boro cloth, there is a variety of decorative techniques, including stencil-resist dying, hand-drawn wax designs (above) and tie dying. 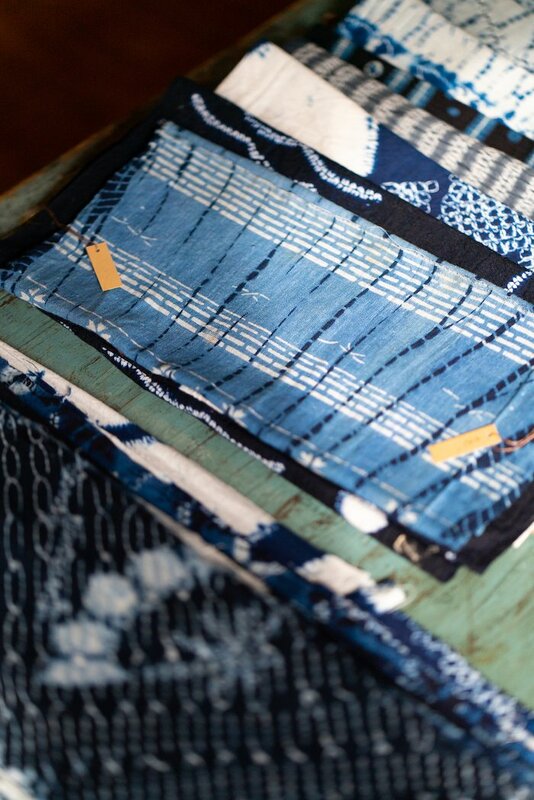 The most popular pieces, though - and my favourite - are the patchwork sheets kept together with rows of sashiko stitching. This method of patching involves not just sewing around the outside of the added cloth, but running lines across it, for reinforcement. As these stitches are usually in white, contrasting against the variegated indigo patches, the effect is striking (see title image). After a while you also notice that a lot of boro cloth also has one short row of white or red stitching somewhere, which was often added as a good-luck charm. I had been following Stephen on Instagram for a while (@SriThreads) and, given I was going to be in New York last Autumn, asked if I could stop by. I didn’t really know what to expect. An address down a side street in Brooklyn, it could have been anything from a shop to a cupboard in someone’s appartment. Fortunately Sri turned out to be a wonderful, calm shrine to boro, a studio with cloth hanging from the walls and ceiling. Tea was boiling when we arrived, Stephen was working at his desk at the back. There was even a small actual shrine opposite the door. Elliot Hammer (photographer and Birch co-founder) and I couldn’t stop smiling. As well as talking to Stephen about his history of importing fabrics, and how it has changed over the past 20 years, we spent a good half hour browsing the pieces on display. Pretty much all of them are for sale, though prices range from $25 to over $7,000 for rare, museum-quality pieces. Elliot was fascinated by a pilgrim’s jacket hanging from the ceiling (above), which was decorated with the stamps that the pilgrim would have received at each stage of his journey. I liked the patched fabric, and ended up buying a narrow (and relatively cheap) strip of very deep indigo, with several patches and one small good-luck line of stitching. It will hang on the wall next to the stairs of our house, running between two stories. Perhaps as a piece of art; certainly as a memento. Sri Threads is open to visitors Monday to Saturday, 9am to 6pm, by appointment only – email stephen@srithreads.com. You can follow the discussion on Japanese boro cloth: Sri Threads, Brooklyn by entering your email address in the box below. You will then receive an email every time a new comment is added. These will also contain a link to a page where you can stop the alerts, and remove all of your related data from the site. Is this an example fetishing of “vintage” going too far? Simon I think you are the best menswear writer, most likely in the world, and have introduced me to a huge amount and educating thousands of readers. But I would question your engagement with the reality of clothing, and it might be argued that this comes close to voyeurism? Yes, I can definitely see that – hence the second question. This isn’t about clothing directly for me though – it’s a piece about craft, about cloth and about how things age. A very interesting article about something I knew nothing about. I suspect many comments will be about the substance of that particular sort of collection and I guess I have a predictably bourgeois take on the merit and indeed ‘authenticity’ of such collecting, but the role of journalist is to document and explain, not to pre-judge and I think you have done that well. This is beautiful, fascinating, and thoughtfully presented. Discussions of quality and beauty in clothing should not preclude the occasional investigation into things with similar principles of craft and aesthetics, for me. It’s wonderful to be made aware of such things. thanks. Is 25g noticeable at all (if I am borderline between clothes) in drape? I have long been a rare book dealer, and in many cases I have collected (and sold) “wounded birds” (a term I picked up from my father). It refers to any volume or piece of ephemera that is in need of serious TLC. Book dealers, paper archivists, librarians, and the like are stewards of objects that are designed and destined to decay. Whether I’m caring for an illuminated manuscript or a first edition of The Great Gatsby with a dust jacket in tatters, it’s all the same – I’m trying to keep that item on life support: both for what it holds inside (the narrative and the form of that narrative), and for the artistry of the binding (whether rendered in vellum or buckram, or something else), the dust jacket (illustrated by Lustig or Gorey or…whomever), or the fore-edge painting executed almost invisibly [https://www.youtube.com/watch?v=OZZQ28YZXSE]. 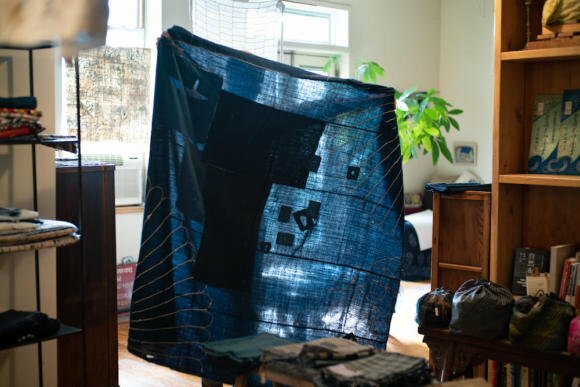 Simon – I hope that you continue to look at clothing and textiles in all their splendor and decay – and that you continue to educate yourself about every nook and cranny of the globe where everyone has, does, and will have to dress themselves for myriad purposes. In the 70’s, Southern USA, patchwork quilts were made into skirts and jackets. This cloth seems similar. I graduated from a highly recognized Art/Design school and one of the things that was stressed was how to really see. From that experience I have been able not only to appreciate a Rothko, but to also find art in a cracked sidewalk or the repetition of pattern in a high rise building. Paying attention to the details and finding beauty in small things is something that pushed my desire to dress well. Thank you for this insightful post about a subject I knew nothing about. 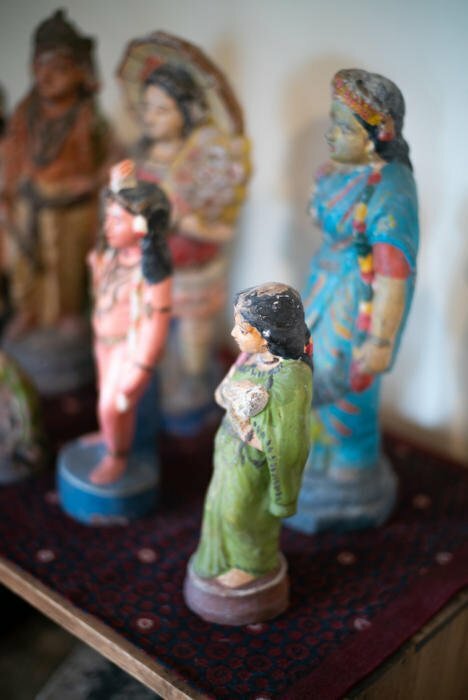 Love the Kolu bommais (the dolls in the last picture).. Interesting article – thank you. A person who lived through the depression told me that in the UK it was not uncommon for poorer families, at that time, to re-use cotton flour bags, cut and sewn, as underwear. The humour was then in seeing the underwear bear the various flour brand’s logo. Unsurprisingly they weren’t very comfortable, especially as they weren’t elasticised. Poverty drove a culture of recycling that continued on through the periods of ‘utility’ and austerity’ during, and immediately after, WW2. However I’m sure none of it reached the artistic heights illustrated above. I wonder what Marie Kondo would do if she got her hands on these things? Would they ‘spark joy’? 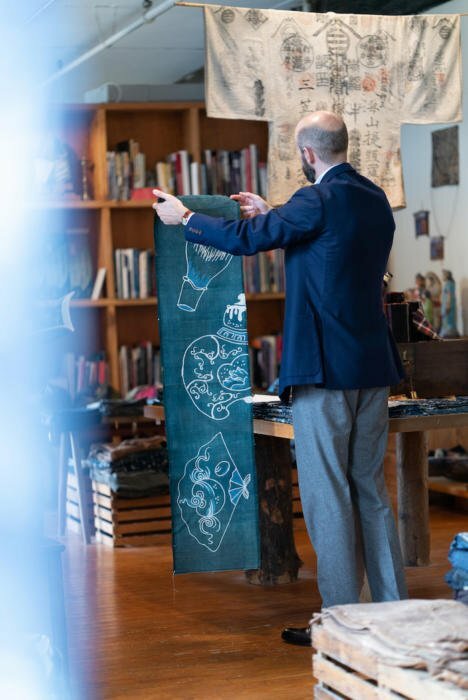 Visvim (and Burton) are into this. Quite the premium. As you say, with boro and similar textiles from other countries, there is a risk of fetishising. Given the majority of boro textiles are three dimentional garments of clothing I was wondering your views, of the western market in particular, cutting them up and stretching them over a canvas/frame to convert say a jacket into a piece of art?